An Ilorin-based legal practitioner, Mr Quadri Yusuf, has urged more women to participate in the forthcoming 2019 general elections in order move the nation forward. Yusuf made the call in an interview with newsmen on Friday in Ilorin. He said that the nonchalant attitude of most women to politics was responsible for their few number in leadership positions in the country. According to him, many Nigerian women believe that politics is a game for men only and therefore, show no interest in who governs them. “Women are needed to make things work perfectly for any nation. They are the builders of a nation because women are mothers of all. “Nigerian Women must come out to join the game and stop seeing it as men’s game alone. “A woman can also become the President of Nigeria just like as demonstrated by Ellen Sirleaf-Johnson, the immediate past President of Liberia. “Some Nigerian women have also attained great heights politically such as former Deputy Governor of Osun State, Mrs Olushola Obada, former Deputy Governor, Lagos state, Mrs Bucknor Akerele, among other successful women politicians,” he said. 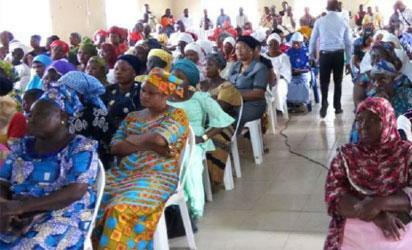 The post 2019 elections: Lawyer wants more women in politics appeared first on Vanguard News.